An expression of love does not have to be a massive gesture and a Valentine’s day gift is no exception. Love is personal therefore only you can determine the ideal way of expressing it. So stop stressing about the perfect gift because a gift marking this holiday should represent yourself as much- if not more- than the person to whom you’re gifting… and if you’re worried about whether or not they’ll like it, just remember that you chose it because it reminds you of them. When it comes to flowers, Le Bouquet has made it easier to navigate through the floral labyrinth by making their Valentine’s Day collection readily available to you (or for delivery!) online. Walking into the shop on Valentine’s Day can be quite daunting: a line-up snaking out the shop door, rose bouquets lining the store walls, florists working meticulously to create seemingly effortless but ultimately stunning floral pieces and boxes upon boxes of incredibly delicious Belgian chocolates ready to be devoured. It’s easy to just point to the nearest arrangement and leave before feeling too overwhelmed but then where was the thought? Where was that connection between your romantic gesture and your Valentine? Don’t buy into the idea that Valentine’s Day is impersonal, because it is only if you make it so. Take it from the family who knows… they’ve been doing it for over 40 years! Luckily for you we have made a list of timeless and trendy pieces to help you filter out the impersonal and narrow onto the perfect! Now ask yourself: is your Valentine timeless or are they trendy? Timeless is for the person who likes to keep things simple, who may be a hopeless romantic, who loves being swept off their feet or who sticks to tradition. So forget the flower bears and forget the blue roses (yeah those exist!) and go for our Select Red Roses arranged and tucked either into a box for the optimal surprise or directly into a vase for maximum impression. Or perhaps our Lush Life arrangement would be more suitable: 12 red roses in a compact handtied bouquet placed into a gold and white ceramic vase complete with gold heart details. 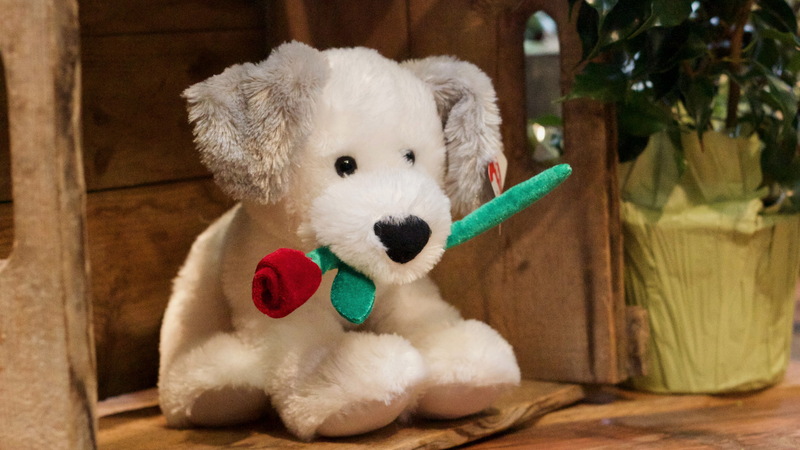 And for those who stick to tradition then All for Love and Puppy Love are packaged deals each including roses, chocolates, and a teddy bear (or in the case of Puppy Love, an adorable beagle plush). Trendy is for the person who loves to live in the moment, knows anything and everything about what’s hot now or can’t settle for what’s been done. In this case forget the teddy bears and standard rose bouquet and go for one of our new products like Rose Gold which features carnations, standard and spray roses, and silver dollar eucalyptus complete in a rose gold geometric vase. If you’re looking for something quite unique then go for our Blue Roses which can also be packaged into a box or arranged directly into a vase. If roses aren’t their favourite check out Kisses in which a ceramic vase dotted with little lips holds beautiful springtime tulips in varying shades of mauve, pink, red and white. Finally, if roses are still the way to their heart but arranging them in a vase is too overly done, try Amour Amour which features a patterned charcoal and white box jam-packed with rose heads of varying sizes and in colours we like to call ‘shades of love’. Flowers are so versatile that even the use of one type of flower, say a rose, can be created into something timeless and trendy. Take for example the eternal roses which have been popping up all over our newsfeeds: specially preserved roses that will last a lifetime are neatly packed together into clear acrylic boxes or a singular red one perfectly fitted into a crystal clear cylindrical case (psst...we have all of those right here). And so when offering this gift you are offering the most timeless Valentine’s day gift- the rose- in an everlasting and trendy way.